Talk to your doctor about the risks and complications of angiography. Peripheral angiography is an outpatient procedure that makes a “map” of the vessels (arteries) in your lower body and legs. This map can show where blood flow may be blocked. You may get medication through an IV (intravenous) line to relax you. You’re given an injection to numb the insertion site. Then, a tiny skin incision is made near an artery in your groin. Your doctor inserts a catheter (thin tube) through the incision. He or she then threads the catheter into an artery while viewing a video monitor. Contrast “dye” is injected into the catheter. You may feel warmth or pressure in your legs and back. You lie still as x-rays are taken. The catheter is then removed. You’ll be taken to a recovery area. 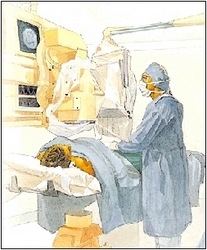 A doctor or nurse will apply pressure to the site for about 10 minutes. You will need to keep your leg still and straight for a few hours. Your doctor will discuss the results with you soon after the procedure. On the day you get home, don’t drive, don’t exercise, avoid walking and taking stairs, and avoid bending and lifting. Your doctor may give you other care instructions.